← Was Planet Marduk (Eden) Located in a Triple-Star System? So far I’ve received more than 200 photos from Carly with too many orbs, light streaks, and other spiritual anomalies to count. When I play with the lighting and contrast in the pictures, I’m sometimes surprised by the presence of some pretty clear entities. Most of them seem to be spirits of people who’ve died and live in dense spirit communities near the Earth in vibration. Occasionally I find entities that seem more alien, but it always takes some work to coax them out (photographically). The picture below, for example, seems to be just three anomalous light streaks (1)… but when I lighten the picture, a figure starts to emerge on the left (2). Cropping the picture and lightening it a bit more, the figure becomes more discernible (3)… but what is it? It looks like some sort of reptilian or dinosaur-ish entity (4) carrying a cane or rod of some kind in its left hand. An alien caught by Carly’s smartphone camera? Carly assures me that there are no poles or structures of any kind at that spot in her yard, so the figure you see in the photo would seem to be one of the many spiritual or quasi-physical beings that move in and out of our world unseen (for the most part) by us humans. The entity, whatever it is, couldn’t have picked a more appropriate time to pass through. As I mention in one of the comments below, the guy looks like Barney the Dinosaur’s dark, other-worldly cousin. This entry was posted in Other-worldly matters, Spiritual realms and tagged aliens among us, spirit photography. Bookmark the permalink. Looks like something swirling, perhaps not a figure but a spiralling energy. Intriguing. That was my wife Regina’s first impression too, and I can see that perspective. Dear Mark: I don’t understand these photos and I wonder what your point is. It just seems to me a long way from ITC research and I can’t work out the link. Your statement “most of them seem to be spirits of those who have died” – how do you know this? Why “most”? How does one know they have died? Or even if they are “spirits” at all? This post (to me) raises many questions which I don’t think can be explained to any satisfaction. What say you? As always, I admire and respect your work. In my research, though, I’ve also become aware of a rather dark, shadowy spirit realm that blankets and destabilizes our world (hence the need for protection when opening an ITC bridge). One purpose of this series of articles is to get a better understanding of that shadow world. Once we have that understanding, it’ll probably be easier in the future to establish stable ITC bridges that can be insulated from the diverse, confused, and often troubled minds residing in the shadow world. I was given a rare opportunity when I was contacted by “Carly,” whose property and sensitivities seem to have opened an amazing portal into that realm. We thought about pulling together a project that could help in a massive healing of that spiritual blemish that’s been part of humanity for many thousands of years. It might include an extension of the great work done by Alan Sanderson in the UK, Tom Zinser here in the States, and Bill Baldwin before them. Long story short, I agree that this series of articles ventures away from “real ITC”… but I think that “to march into hell for a heavenly cause” might have some tremendous rewards, if we do it right. As always, Liz, I very much appreciate your comments, which help keep me grounded and remind me to reflect on the higher purpose. Thanks! Awesome Halloween post! What a fascinating figure in the background…and what a strange feeling I get studying it. At first glance, I see the rod, and the figure holding it appears to be a “cloaked” figure. It is reminiscent of the folkloric “grim reaper”! 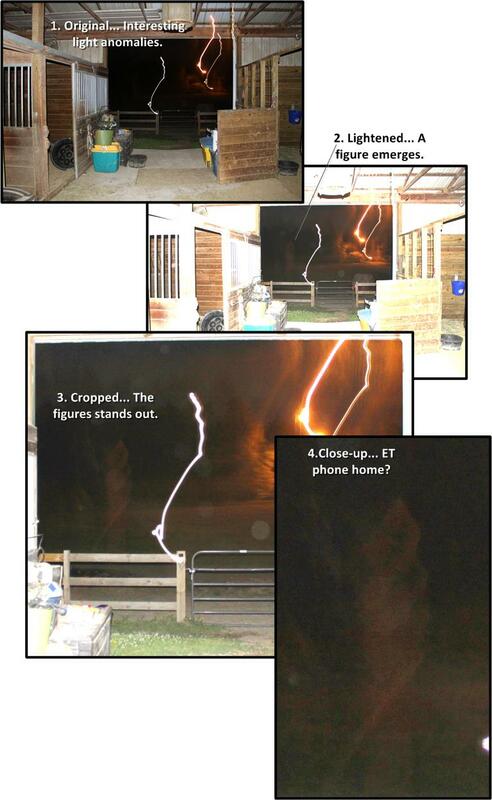 Whatever this actually is – spirit, alien, pure energy – it’s definitely not of our physical realm. Maybe this is a member of a species who were also busy long, long ago trying to establish their kind of life forms on Earth… at the same time the Edenites were busy engineering physical humans here, after the destruction of their material world. These other guys might have helped produce the various species of dinosaurs. Interesting possibility, eh? Has Carly ever experimented with the water and light reflection technique? There’s not a doubt in my mind that she would get phenomenal results with it. I hope you’ve been well. Best of success with your techniques. May the results get better and better. Dedicated experimenters eventually find techniques that work especially well for them. What Carly has found is currently having amazing results, and her techniques feel right to her at the moment, I think. Thank you Mark. Things have really started to improve after years of effort. Carly’s results are phenomenal. No question. I was just curious as to if she had tried any other methods. She’d be successful with any technique, I’m guessing. I’m highly interested in participating in your project, too. If you need another volunteer for Tier 1, I’d be more than happy to help. Hope you enjoyed your Thanksgiving.